Package includes Tornado reconnaissance jets, a naval frigate and up to 1,200 troops. The German cabinet on Tuesday approved a package of military assistance to back the international fight against the ISIS (aka Islamic State or Da'esh) jihadist group following the Paris massacres. The package, which still requires parliamentary approval, covers Tornado reconnaissance jets, a naval frigate and up to 1,200 troops following a French request, the government said in a statement. "The German contribution serves the fight against terrorism under the auspices of the alliance against ISIS and is aimed at supporting in particular France, Iraq and the international alliance in its fight against ISIS," the mandate says. The mandate is for one year at a cost of 134 million euros ($142 million) and can be extended in 2016, reported AFP. By providing for up to 1,200 soldiers for aerial reconnaissance and support, it would be the largest current Bundeswehr mission, following a drawdown in Afghanistan. Foreign Minister Frank-Walter Steinmeier acknowledged ahead of the cabinet vote that the war against ISIS could be a protracted one. "We are doing what is militarily necessary, what we can do best, and what we can back politically," Steinmeier told the daily Bild. "We need patience against an enemy like ISIS." The head of the armed forces union, the Bundeswehrverband, Andre Wuestner, told public broadcaster ARD that he expected the fight to last "far more than 10 years" and called for a "clearly defined mission". No date has been set for the parliamentary vote on the government's decision but approval is considered virtually guaranteed as Chancellor Angela Merkel's "grand coalition" government has an overwhelming majority. 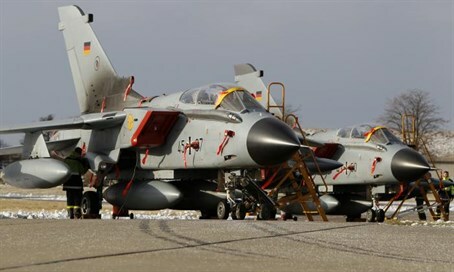 Germany is to send an unspecified number of Tornado aircraft fitted with surveillance technology that can take high-resolution photos and infrared images, even at night and in bad weather. A German frigate will help protect the French aircraft carrier Charles de Gaulle in the eastern Mediterranean, from which fighter jets are carrying out bombing runs, and the tanker aircraft could refuel them mid-air to extend their range.